The recent warm weather has me thinking back to last summer’s amphibian fun. 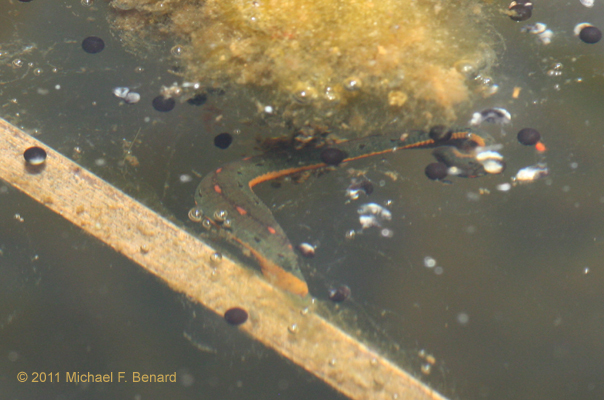 One of the coolest natural history observations we made was first noticed by a student researcher who was studying the factors that make a female frogs prefer to lay eggs in one pond over another. 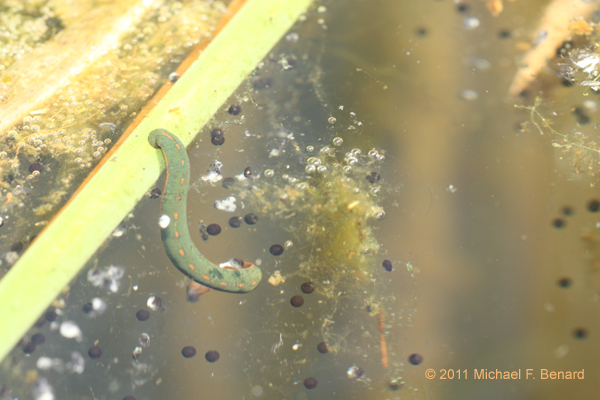 This required him to regularly search ponds for fresh green frog egg masses. 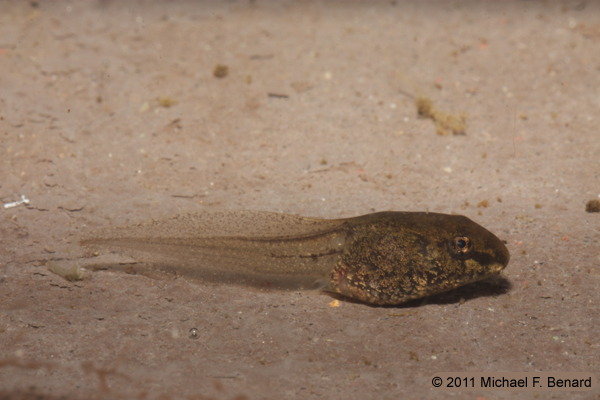 One day he reported finding a large bullfrog egg mass that was covered in leeches. We hurried over to check it out! 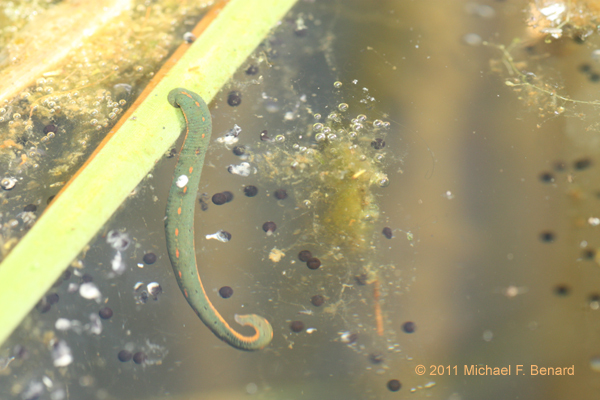 These are American medicinal leeches (Macrobdella decora), although we normally just call them fire-belly leeches. These are voracious consumers of amphibian eggs. 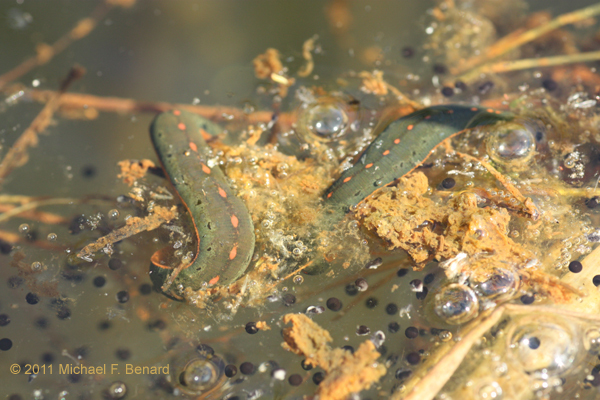 When densities of these leeches get high enough, they can decimate a bullfrog egg mass with over ten thousand eggs in just a few days. 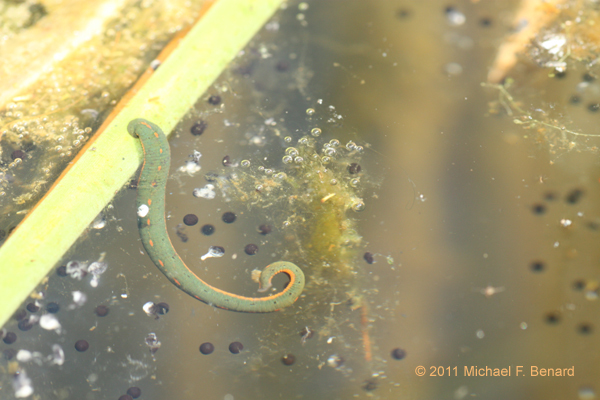 The photo series below shows one of the leeches extending its body to wrap around an egg. The gaping mouth can also be seen on the end of the leech. Although we counted over two dozen leeches on this single egg mass, the leeches did not seem to interact with one another. 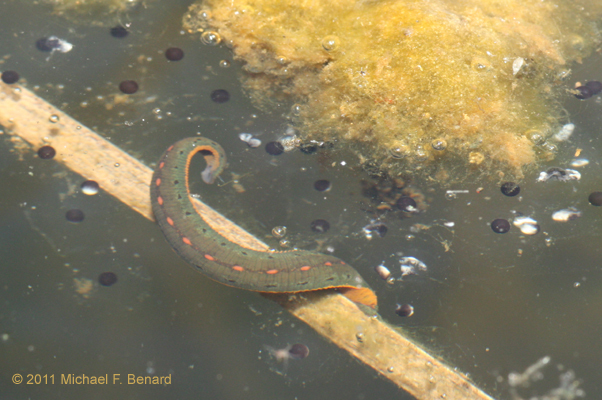 There were no obvious aggressive interactions between leeches, nor any obvious spatial distributions. Some leeches were clumped close together, while others were isolated. The feeding behavior seemed fairly stereotyped. 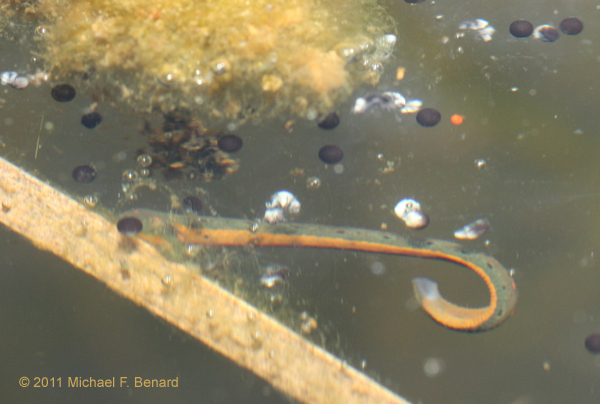 A leech would anchor one end of its body to vegetation (mostly cattails), and extend the rest of its body out into the water. Then it would curl its body back into a ball, sometimes collecting an egg into its mouth, but more often ending up with no egg at all. The curling motions in search of eggs appeared to be random. 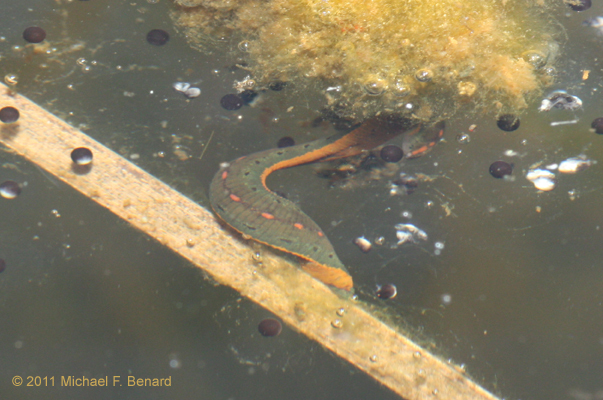 Watching a single leech eating eggs was fascinating, but the view of the entire egg mass covered in squirming, writhing leeches conjured a second reaction: I was glad those leeches weren’t swarming on me! 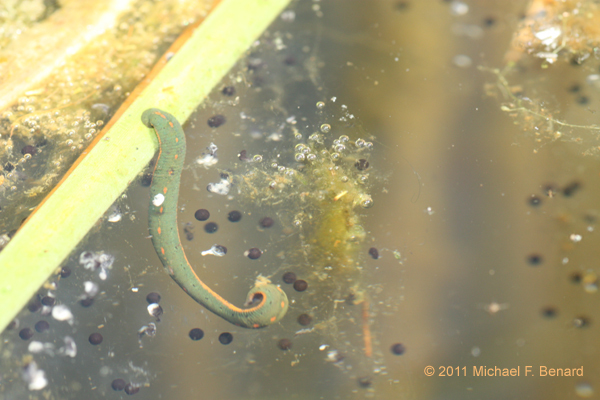 Of course, the leeches don’t always get all of the eggs in a pond. 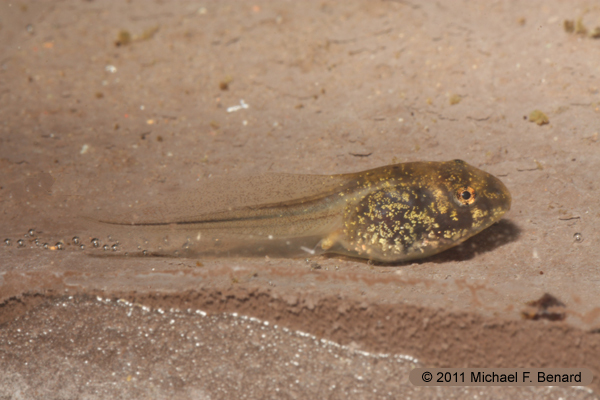 Here’s a couple photos taken a few weeks later of some ranid tadpoles that did successfully hatch, and escaped predation by leeches. This entry was posted in Natural History and tagged Bullfrog, Frog, Invertebrate, Leech, Predation. Bookmark the permalink.